Army Staff. Sgt Ty Carter on Monday became the fifth living recipient of the Medal of Honor from the wars in Iraq and Afghanistan for his valor in helping stop a surrounding enemy force from overrunning a remote outpost in Afghanistan. “It was chaos, a blizzard of bullets and steel” that Carter and the other defenders faced at Combat Outpost Keating in the 12-hour firefight, President Obama said. But the Americans pushed and ultimately retook the camp. Carter now faces another battle against post-traumatic stress. Despite the “nightmares, the heartaches, the anxiety” he experienced from the fight, Obama said, Carter went back for another deployment to Afghanistan and has committed to working with others coping with stress. By his example, Carter “can help put an end to any stigma that keeps folks from getting help,” Obama said. This marks the first time since 1967 that two survivors of the same battle were awarded the Medal of Honor. 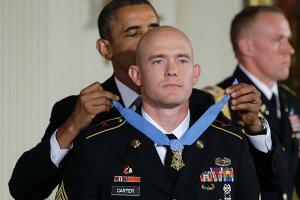 Obama presented the award last February to Staff Sgt. Clint Romesha, who served with Carter at COP Keating. The last two surviving recipients were Spec. 4th Class Raymond R. Wright and Sgt. Leonard B. Keller, who both received the Medal of Honor for actions at the battle of Ap Bac in Vietnam on May 2, 1967. Carter, 33, was joined at the ceremony by his wife, Shannon, son Jayden, 14, daughter Madison, 8, and nine-month daughter, Sierra. Obama said that before the ceremony that Madison asked him what a hero should be like, and he told her to look at her dad. On Oct. 3, 2009, Carter and 52 other soldiers from Bravo Troop, 3d Squadron, 61st Cavalry Regiment, 4th Brigade Combat Team, 4th Infantry Division, were defending COP Keating near the village of Kamdesh in eastern Nuristan province. The base was in one of the most violent sectors of Afghanistan and was also one of the most vulnerable because it was surrounded by steep terrain. The troops there said “it was like being in a fishbowl,” Obama said. At first light on Oct. 3, an estimated force of 300-400 Taliban fighters attacked their position. Carter had been asleep. “That position was attacked so often that you get used to waking up to machine-gun fire,” Carter said at a news conference at Joint Base Lewis-McChord last week. Eight soldiers from Bravo Troop were killed that day. Twenty-seven others were wounded, including Carter. To underline the ferocity of the fight, Obama went through the list of medals earned by the Keating defenders: 37 commendations, 27 Purple Hearts, 18 Bronze Stars, nine Silver Stars, and now two Medals of Honor. At his own news conference, Carter said he was accepting the honor on behalf of others. “I am an American soldier, just like thousands who have served, will serve and are continuing to serve this great nation,” he said.